Granola is a food enjoying brisk growth around the world, for very good reasons. Appreciation of the health benefits of oats is increasing, and there are now many opportunities for granola, both in the expanding cereal bar market and as a breakfast cereal that is quicker and more convenient than oatmeal and porridge. Now is clearly the time to consider entering this vibrant market. 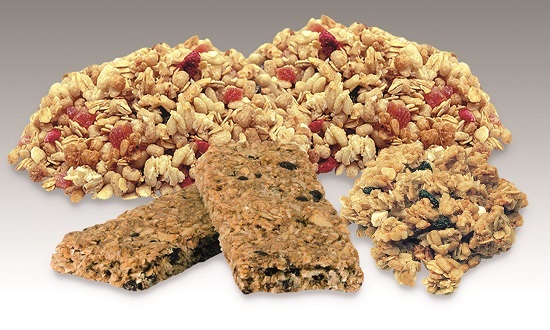 Baker Perkins has been designing and making granola systems for more than 20 years, acquiring more experience and expertise in bar and cereal production than any other supplier – and is continually adding to its selection of end product opportunities. Granola has a truly global appeal and there are Baker Perkins production plants in Asia, Europe and North America. Granola can be formed into a broad selection of appealing products; the basic mix can easily be enhanced with inclusions such as dried fruit, nuts, seeds, honey or chocolate chips to turn a cereal or bar into a luxury added-value product. Baker Perkins’ latest development is new equipment to make crunchy granola bars - a biscuit type product with a sharp bite. The healthy image of granola can be developed with the addition of minerals, vitamins and protein to provide a multitude of ‘good for you’ benefits. Foods high in protein and fibre are becoming mainstream as consumer diet awareness grows; cereals and bars are a convenient and palatable carrier for these beneficial products, and existing recipes can be easily augmented. Granola consists of oats coated with oil and then sugar; the oil prevents sugar being absorbed by the oats before baking. We are working on alternative formulations with binding agents that will reduce sugar content and create a new wellbeing market. Baking rather than conventional drying of granola is the defining feature of Baker Perkins’ lines. In the drying process oats do not have time to cook thoroughly, and much of the starch in the oats remains raw. Baking, on the other hand, ensures complete cooking of the oats which gives a softer texture, fuller flavour and more attractive appearance than drying. Consumer appeal is markedly improved. The baked product is also more consistent than the dried alternative. 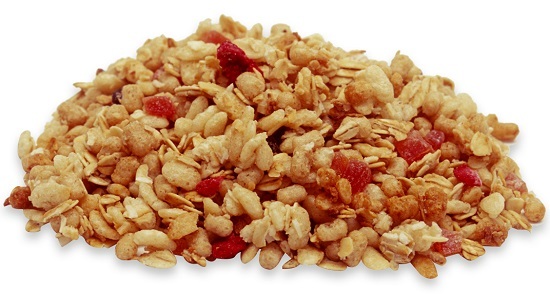 Dried granola cereal tends to vary in size with large, tough clusters at the top of the bag, descending to fines or dust at the bottom. 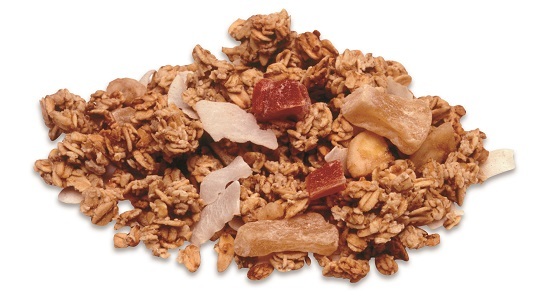 The characteristics of baked granola cereal are a consistent cluster size throughout, and a product that is softer and easier to eat. The Baker Perkins convection oven is ideally suited to granola baking, removing moisture from the product and causing the sugar to melt. Convection air circulating gives an even bake; precision control of temperature and airflow creates a stable and predictable environment for fast baking and minimal fuel consumption. Baker Perkins’ know-how has allowed us to develop specific technology for every stage of the process. Mixing has to create an exact texture, and density on the oven band is crucial. Too dense a mix will not bake properly; too loose and the mass dries out. Assisted cooling at the oven discharge binds the mass together to give the characteristic baked granola crunch, and it is essential to achieve exactly the right rate of cooling. Whatever granola product you need, Baker Perkins has the answer – and the facilities to create and prove a product range in our Innovation Centres in Peterborough and Grand Rapids.